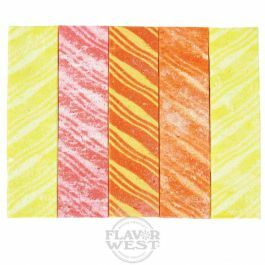 Rainbow lined gum flavor is characterized by its own taste. It makes any pastry, candy, chewing gum or smoothie indulgent at any time. Type: Rainbow sherbet Water Soluble Flavoring. Ingredients: Natural and Artificial Flavoring, Propylene Glycol and Ethanol. USP Kosher Grade Flavoring. Usage Rate: 15-20% for E-use. Flavor Suitability: Suitable for desserts, ice creams, pastries, candy, lip balm and more. Specific Gravity: 1.06 No Refunds on Flavoring. This is an incredible flavor, I would start with 10% and work up, it's a great value and fun. Unlike many fruity mix flavors, this one is incredibly well balanced. I totally reccomend it. I mix at about 12% and max VG. Better after steeping, but great period. Sometimes replace 1-2% with Grape Soda, but Its a lot sweeter. Love the price and am up-sizing to 16oz bottle this order. Love love this flavor---an easy pleasant vape---get it you won't be disappointed!